Back in 2015, Disney announced that their new attraction Toy Story Land is being developed for Disney's Hollywood Studios at the Walt Disney World resort, and during the D23 Parks and Resorts panel, it was revealed that this attraction will open in summer 2018. While no specific date was given, the studio unveiled new concept art for this attraction, while announcing another attraction called Pixar Pier for Disney's California Adventure park at DisneyLand. No opening date was given for Pixar Pier yet, but there was new concept art that debuted. Bob Chapek, Chairman of Walt Disney Parks & Resorts, made the announcement during the Parks and Resorts panel, courtesy of Disney Parks Blog, with this attraction giving fans the chance to experience this world while being "shrunk" to the size of a toy, to explore the world of Andy's backyard with all of your favorite Toy Story characters, including Woody and Buzz Lightyear. At one point, this park's opening would have coincided with the theatrical release of Toy Story 4, although the studio pushed it from a summer 2018 release to summer 2019 last fall. Toy Story Land will feature two new themed attractions. 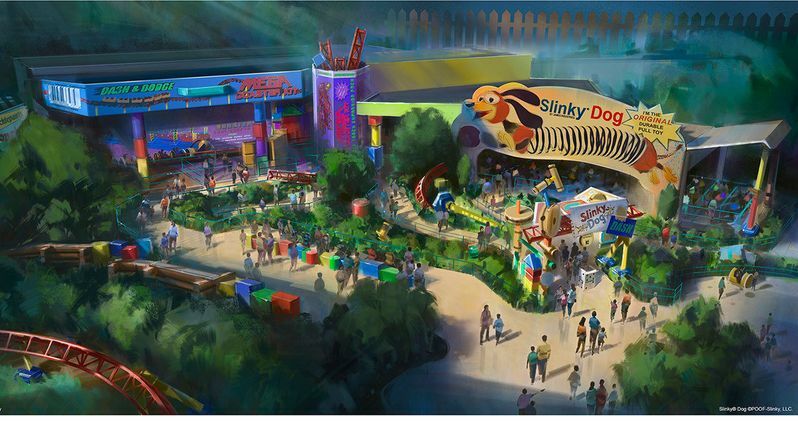 Slinky Dog Dash will be a family coaster attraction where you'll zip, dodge and dash around many turns and drops that Andy has created to really make Slinky and his coils stretch to his limits. Alien Swirling Saucers will also be a new attraction at Toy Story Land. It's designed as a toy play set that Andy got from Pizza Planet, inspired by the first Toy Story film. Aliens are flying around in their toy flying saucers and trying to capture your rocket toy vehicle with "The Claw." Pixar Pier will feature a brand-new look for the area now known as Paradise Pier, as some of your favorite characters come to life on this seaside waterfront. You will discover whimsical neighborhoods filled with your friends from The Incredibles, Inside Out and even more of your pals from Toy Story. Building upon the evolution of Disney California Adventure park that began in 2007, Disney is building more new worlds for you to step into and enjoy your favorite stories. This permanent addition to the park will open during a new limited-time celebration taking place throughout the Disneyland Resort in 2018, Pixar Fest! Experience the magical worlds of Pixar in brand new ways as the entire resort comes alive with some of your favorite stories. At Disneyland park, this incredible celebration will feature a brand-new fireworks spectacular as well as the return of the guest favorite, Pixar Play Parade. The popular "Paint the Night" parade returns, only this time, to Disney California Adventure park. Hopefully we'll have new details on the Toy Story Land and Pixar Pier attractions as we get closer and closer to their debuts in 2018. Until then, take a look at the new concept art photos that were unveiled at D23 this weekend.